I’ve come to know many people with TN in the past months (warriors one and all) and each of us have made certain accommodations in our life because of our condition. Some are clearly significant such as quitting work or moving to a less harsh climate. Yet others are little things that we do each day to try and minimize our pain. Taking showers at night instead of in the morning to ensure no splashing destroys our day. Not eating or drinking certain foods that seem to trigger pain. Always carrying a scarf just in case a wind – or heck, even a breeze – kicks up to aggravate our delicate nerves. One of the changes I have made has to do with my hair. I’ve heard several female TN sufferers indicate that they have cut their hair to make their lives easier and possibly more pain free. I, on the other hand, have been growing mine out. It is now just past my shoulders. For many years I had sort of a bob/China doll hairstyle. The longest I ever let it get was about chin length. It wasn’t one of those perfectly smoothed bobs shown on the Vidal Sassoon commercials – I am a person who appreciates jagged edges. The problem with the hairstyle was that I would often wake up with bedhead that could only be described as sculptural. My hair would be standing up in some places, shifted in different places and sort of bent in a way that could never be reproduced even if I tried. And due to the gobs of product I use, no amount of combing or flat-ironing could get it any closer to presentable than maybe “crazy bag lady”. So in order to go out, or even get the mail, I would have to wash and restyle my hair requiring that I aim the blowdryer toward my face to get the bangs right. And if you’ve got TN, you know that just wasn’t gonna happen. Plus, if I’m being totally honest, I just got too darn lazy to do it. So, I’ve grown my hair. And I gotta say, it feels weird. It’s like this alien entity has taken residency on my head. There’s a weight to it that I’m not quite used to. It looks fine, I think, but it is somewhat distracting. And therein lies the problem. I’ve become a flipper. Okay, there are many definitions to that term, so for specificity’s sake, I’m referring to flipping my hair. I am constantly manipulating it; brushing it back off my shoulders, sweeping it over to one side, twisting it up in a momentary chignon. And today, while scrunching my hair up on top of my head in a wad while staring at a blank canvas (I take a painting class), I thought, “My God. 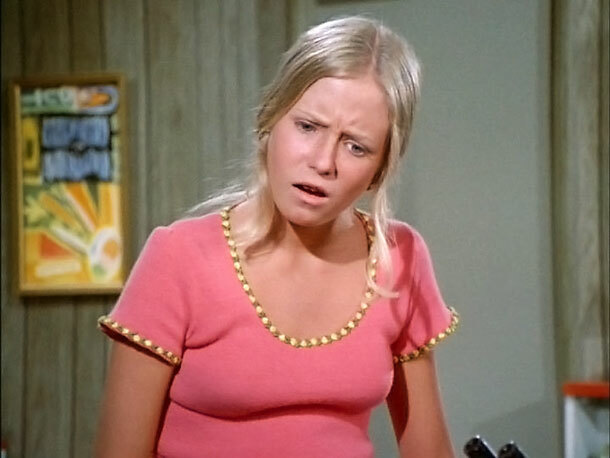 I have become Jan Brady.” I remember watching The Brady Bunch as a kid and seeing Jan, and yes Marsha, constantly flipping their hair. Jan even had this peculiar gait when she walked; kind of a zigzag motion that made the hair down her back sway back-and-forth with each step. As I kid, I probably thought it was cool because, even if she was the whiny, attention-seeking middle daughter, she was on TV. But now that I am 51 and perhaps more self-conscious, it is so not cool. In face, I think it’s pretty darn annoying. So I’ve gotta figure out how to handle this situation. Do I cut it now? Wait for it to be long enough to donate to “Locks Of Love” then whack it off? Just keep growing it until it’s long enough where it doesn’t fall forward on my shoulders? Hmmmm…this is going to take some serious consideration. I’m just gonna have to move my hair out of the way so I can do some thinking. I’d make a goal for locks of love, you may find out the length makes a difference and decide to keep it. I cut mine and now that it’s past time to trim it up I wish I had kept the length.